The Bangalore-based Hindustan Machine Tools (HMT) in collaboration with the National Association of Blind (NAB) unveiled a range of Braille watches exclusively for visually impaired women in Mumbai on Friday. The Braille watches would now enable visually impaired women in the country to have better and cheaper options to know the time and keep pace with it. These watches were distributed to a group of blind women students at the launch ceremony. Movie actor, Gauri Karnik, who was the star attraction at the event said that more corporate organisations should come forward for such a social cause. It's fabulous. One has to because you know just because you don't have sensory power doesn't mean you should be kept away from living a normal life. And having a watch is a primary necessity. So anybody can look in and continue their life very well. So it's a fabulous initiative and I feel more people and more companies should come up with more initiatives like this, said Karnik. The watches, which have raised patterns on the dial or Braille numbers, make it easy for a visually impaired person to sense the time. The watches are the same like any other mechanical watches. The mechanism is the same. The difference is only on the dial which has got the projections which the blind people will sense. They feel it and then understand the time, said S Paulraj, Managing Director of HMT. Until the launch of this watch by the HMT, the Braille watches available in the Indian market were of foreign make and expensive too. However, the HMT watches with a price tag of Rs 400 would be sold on a no profit and no loss basis to NGOs, vocational and educational institutions working for the visually impaired persons. The story of a girl who lost her eyesight at the age of six but never let go of hope through the years that saw her getting enrolled at the prestigious St. Xavier’s College in Mumbai so moved President Pratibha Patil that she decided she must meet this brave young woman. Hailing her as a brave girl who fought her problems like a warrior — she lost her eyesight due to medical negligence — the President on Tuesday received the first copy of book What am I? that is based on the life of Siddhi Desai. The book is written by Vrinda Bhargava, a college teacher in Nashik. “Earlier as the Social Welfare minister I had the opportunity to meet so many people in difficult situations, including many visually impaired persons, and that really made me wonder how these people managed. I even decided to blindfold myself for a day to feel what it must be for them and I could not manage beyond an hour. Imagine, how people without eyesight manage, what courage and hope reside in them. This girl and her mother’s incomparable and unflinching support is inspirational and I hope all girls and boys grow up with her kind of ambition, courage and hope. This girl may not have eyesight but she has vision and self-knowledge that many with eyesight lack. I am moved by her story,” President Patil said on the occasion. Siddhi Desai, who was also present on the occasion, doesn’t feel impaired by the loss of eyesight. A tiny telescope, already approved for use in Europe, can be implanted in one eye to help people with an advanced form of macular degeneration. The device takes the place of the natural lens. A TINY glass telescope, the size of a pea, has been successfully implanted in the eyes of people with severely damaged retinas, helping them to read, watch television and better see familiar faces. The new device is for people with an irreversible, advanced form of macular degeneration in which a blind spot develops in the central vision of both eyes. 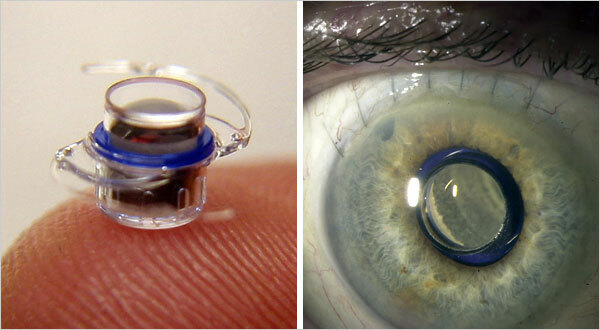 In a brief, outpatient procedure, a corneal specialist implants the mini-telescope in one eye in place of its natural lens. The telescope magnifies images on the retina, extending them so they fall on healthy cells outside the damaged macula, said Allen W. Hill, chief executive of VisionCare Ophthalmic Technologies in Saratoga, Calif., the implant’s maker. In March, an advisory panel to the Food and Drug Administration unanimously recommended approval of the device. VisionCare says it expects the F.D.A. to give its O.K. later this year. The device has already been approved for use in Europe. The implanted telescope holds much promise for patients, typically elderly, who suffer from end-stage, age-related macular degeneration, or A.M.D., said Janet P. Szlyk, a member of the advisory panel. Dr. Szlyk is executive director of the Chicago Lighthouse for People Who Are Blind or Visually Impaired, a social services agency. The device does not cure the disease, but it does improve visual acuity, she said. For example, a person who might usually see a blur when looking at a friend’s face might, with the help of the magnified image, see a blur only in the area of the person’s nose or mouth. The telescope is implanted in one eye for jobs like reading and facial recognition. The other eye, unaltered, is used for peripheral vision during other activities like walking. After implantation, extensive therapy is crucial, she said, to learn to deal with the different abilities of the eyes. Henry L. Hudson, a retina specialist in Tucson, Ariz., and lead author of two papers on the telescope published in peer-reviewed journals, said the device was not for everyone with A.M.D. “Maybe only 20 out of every 100 candidates will get the telescope,” he said. “They may not be eligible because of the shape of their eyes,” or they may have another problem, like maintaining balance, that precludes their selection, he added. After F.D.A. approval, VisionCare will apply to Medicare to cover the device, Mr. Hill said. “We anticipate that it will be seen as a covered benefit for the improvement of visual acuity,” he said. The price of the device has not been set. Current tools for ameliorating low-vision problems, like glasses fitted with telescopes or reading machines, are typically not covered by insurance. Dr. Bruce P. Rosenthal is chief of low-vision programs at Lighthouse International in New York City, where telescopes mounted on eyeglass frames, for instance, might be prescribed for people with A.M.D. to help them watch a sports event. He said that patients might be as well served by these glasses as by the new implants, and that he hoped long-term studies would compare the benefits of the two approaches. Dr. Rosenthal said the implanted telescope might be beneficial for some patients, “especially if they don’t want other people to know they are visually impaired.” Telescopes mounted on eyeglasses bulge outward, often extending an inch or so beyond the frames. But he is concerned that people using implants might have trouble with balance. “There is a potential for falling when a person has a big image from one eye and a normal-sized image from the other,” he said. DURING trials of the device, there was no increase in the incidence of falls among participants, Dr. Hudson said. More than 200 patients received implants in the study, and the effects have been tracked in the group for the past five years. A car for the visually impaired? This story begins in 2006, when the Blind Driver’s Challenge was initiated at Virginia Tech in response to a proposal made by the Jernigan Institute, a part of the National Federation of the Blind. This month, members of the Robotics and Mechanisms Laboratory have made previously impossible dream possible: giving the blind an opportunity to drive. The VT team has created a cutting-edge four-wheel dirt buggy, one that employs a whole range of technical gadgets to help a visually impaired person to navigate a closed driving course. The car has ‘eyes’ made of laser range finders that work as fast-paced sonar, relaying data on the distance to obstacles. There are voice commands coupled with a vibrating vest to aid in stopping, turning, and accelerating. And said voice commands are rigorous and detailed. Wes Majerus, of the Jernigan Institute, the first blind person to drive the buggy, stated, "As far as the differences between human instructions and those given by the voice in the Blind Driver Challenge car, the car's instructions are very precise. You use the technology to act on the environment -- the driving course -- in a very orderly manner. In some cases, the human passenger will be vague, "turn left" -- does that mean just a small turn to the left, or are we going for large amounts of turn?" There was an interesting observation during the tests: the blind did better than the sighted. "There wasn't a moment's hesitation with any of our blind drivers, whereas blind-folded sighted drivers weren't as quick to let go of their preconceptions," said Greg Jannaman, who led the Virginia Tech student team in his senior year and graduated in May. "The blind drivers actually performed better than their sighted counterparts." The lab tackling the project is composed of undergraduate students as well as researchers. Though it has been a long road from the inception of the project in 2006, the Robotics and Mechanisms Laboratory found the experience well worth the struggle. "I thought it would be a very rewarding project, helping the blind," said Dennis Hong, the current faculty adviser on the project. "We are not only excited about the vehicle itself, but more than that, we are excited about the potential of the many spin-off technologies from this project that can be used for helping the blind in so many ways." This is the first working model of a car to aid visually impaired people. While there have been mock-ups in the past, none actually allowed for a true driving experience. Mark Riccobono, the executive director of the Jernigan Institute, also took a spin behind the wheel. “He called his test drive historic. ‘This is sort of our going to the moon project,’ he said. " Kids from across the state took part in a special camp for the visually impaired Wednesday. It's called Camp Ability and is meant to help blind kids stay active. Camp counselors help them feel their way around the court. Kids try sports they may not otherwise attempt, like swimming or track running. The camp runs through the end of the week. Five-year-old Iliana is visually impaired, but when she has trouble, her preschool classmate Lulu is there to help. "I like to come with Iliana because I want to help her," Lulu said. "I hold her hand because sometimes, sometimes she needs help." Iliana and Lulu's simple camaraderie, perhaps uncommon at most schools, is normal at the Lighthouse International preschool in New York City, where several blind students are taught alongside sighted students. The school is part of Lighthouse International's nonprofit mission to prevent blindness and to provide services for those already living with visual impairment. "The kids that are visually impaired, they're getting a regular preschool experience just like every other child should get," Lighthouse International School principal Gregory Santamoor told "Good Morning America." Santamoor said the preschool runs with a "little extra adaptation" for the students with visual impairment. The paper the kids use is raised so the students can actually feel their work. Every book the school has in print, they also have in braille. Whatever the sighted students learn, the visually impaired students learn right along with them. "We have the letters of the week. So, as the children are learning their print letter of the week, the child who is blind is learning their braille letter of the week," teacher Regina D'Ambrosio explained. The school has six integrated classrooms with kids ages 3 to 5. All of them follow a standard preschool curriculum. Some parents, like Lulu's father Rocky Kenworthy, were hesitant about enrolling their child in a school that makes a point to teach all children as similarly as possible. "In the beginning, I was thinking, 'Is she not going to get the attention she might get at another school even if it were a little bigger classroom because of the special needs that these children might need," Kenworthy said. But with 12 kids and three teachers in each class, the kids do not want for attention and Kenworthy said the school also teaches an early lesson in compassion. "They learn that it's good to be kind," D'Ambrosio said. "It's good to help people and help your friends, and then they get exposed to that at a very young age... It's a life lesson learned." The visually impaired also benefit from the joint education, according to a small study published in the Journal of Visual Impairment and Blindness in 2002, which said it helps blind children be more social. Maribel Montes, mother of John, who has limited vision, said she can see the difference in her son. "When he first started, he was socially withdrawn and not as confident," Montes said. "But now, he has tons of friends. He knows all the staff. His confidence has built incredibly." But according to D'Ambrosio, the greatest advantage to the school is that the kids lose sight of their differences. "They'll never say, 'Iliana, my friend who is blind.' It's 'Iliana, my friend,'" she said. Quiz was a hit with the visually impaired! The Blind Peoples Association experimented for the first time with a quiz for mentally challenged children as well as children with multiple disabilities on Friday. A wave of enthusiasm was seen among the 45 participants in the ages between 5 and 18 years. There were nine teams each with five members. Questions were read out loud for those children who could hear and see. For those who could neither speak nor see, tactile stimulation was used. There were three rounds in all. The first round consisted of questions that were related to their curriculum, the second of general knowledge questions while the third on the monsoon season. "Our main focus was to make these children realise they too, like any other normal child, can participate in a quiz and the response among them was amazing," says Vimal Thawani the organiser. "Making them participate in the quiz gives them a chance to feel important as well as focuses on how much the child knows," says Thawani. The winners of the competition were Alay Patel, Mrunal Patel, Deep Trivedi and Hemang Mehta. Hemang says, "I had a lot of fun while taking part in the quiz, I found the questions very easy and I'm really glad my team won." Rachel Elizabeth Petherbridge, Junior Miss Garner 2009, attended an ice cream social Saturday, June 14 with the N.C. Association for Parents of Children with Visual Impairments. A lifelong resident of Garner, Rachel, 12, was diagnosed at an early age with ocular albinism, nystagmus and exotropia, a combination of visual impairments that are not completely correctable with glasses (though surgery has mostly resolved the exotropia). A regular volunteer at the SPCA, a violinist, dancer and singer at the Garner Center Stage School of Performing Arts, Rachel hopes to inspire others with physical challenges to participate in regular activities to the fullest extent they possibly can. Rachel met some amazing children at this event who enjoy the same things that all kids do: playing games, hanging out with their friends and even learning to play musical instruments. Many of these children now attend regular public schools thanks to early intervention, including the preschool program at the Governor Morehead School for the blind. Unfortunately, current state budget cuts include a proposal to close the Governor Morehead School, a very real concern for the visually impaired community. Rachel’s mother, Donna Petherbridge, agrees with her daughter, noting that parents of children with disabilities often struggle to understand what their child’s abilities and limitations are and how to best support them. “We are fortunate that we’ve had excellent support from the schools and various organizations to assist Rachel - from vision, orientation and mobility specialists that have helped Rachel use low-vision aids in both schoolwork and in the community to organizations such as the N.C. Library for the Blind where we can obtain large print books,” Donna said. Budget cut discussions aside, Rachel simply hopes when people come across children with disabilities, they will focus on what these children can do, rather than on what they can’t. Sue Buckley, second from right, teaches kitchen skills to visually impaired students, from left, Sarah Holloway, Erin Moore and Nicole Anderson at Buckley’s West Knoxville home. Buckley is helping the young women become more independent through an organization called Club VIBES, a mentoring program. The News Sentinel is highlighting good news, interesting people and inspiring stories in our communities. If you know of a Bright Spot you’d like readers to know about, please send your ideas to news@knoxnews.com. The lesson plans at Club VIBES include how-to's on flirting, cooking, socializing and even reading mail, all of which pose a unique challenge for the club's members. Club VIBES, which stands for Visually Impaired and Blind Enhanced Services, is a mentoring program in Knoxville designed to help blind or visually impaired teens transition from high school to the work force or college. Knoxville couple John and Sue Buckley spearheaded the program with the help of area vision teachers and some of the blind youth in the community. Both John and Sue are blind themselves. "John's been visually impaired his whole life," Sue Buckley said. John Buckley was born with glaucoma and cataracts. By age 17, his vision was almost completely gone. Sue Buckley's vision didn't completely disappear until she was 33. The couple have learned to live life without sight. The pair can't drive, but they do just about everything else. They cook, clean, shop, manage a household and work. Sue Buckley even competes in triathlons. She placed third and second in her age division in her first two triathlons and was the only blind person to compete. The Buckleys will pass the life skills they've learned over the years to the new members of Club VIBES. The group already has 15 members, more than John and Sue expected. The young men and women, most of whom are between ages 21 and 24, meet once a month. During the meetings, the Buckleys said, they address members' concerns about finding employment, arranging transportation and living independently. The Buckleys want to pick up where the school systems left off. "The schools just don't have the time to keep up with all of the skills a blind or visually impaired person needs to know," Sue Buckley said. On a recent afternoon, Nicole Anderson, Sarah Holloway and Erin Moore, all members of Club VIBES, met at the Buckley residence to cook. The three girls sat around the table as Sue Buckley retrieved a large knife - just what she needed to show the girls how to cut a watermelon. One by one, the girls stepped up to the counter and placed their hands over Sue's to feel how Sue positioned the knife and guided it through the fruit. "Teachable moments" - that's what Sue Buckley calls them. The girls said they like to learn these various life skills, but they also value Club VIBES for another reason. "I am just excited to be able to get together with other visually impaired people," Anderson said. The group has loftier goals, though. The club's members will pass what they learn to younger children who are in a similar situation. "Right now, the group has to learn to gel, but eventually we want them to do outreach in the schools," Sue Buckley said. Lindsey Ziliak can be reached at 865-342-6336. Looking for a peaceful and relaxing night for your family? The Long Beach Aquarium of the Pacific is hostlng a special Autism Families Night on Tuesday, June 23, 2009. This event is only open to those with autism, either adults or children. Admission is $11.95. Members and children under three are, as always, free. Families can enter the Aquairum after 5:00 p.m. and enjoy all attractions (except Lorikeet Forest, their bird exhibit) until 9:00 p.m. The Aquarium is one of the largest of its kind in the United States. It contains more than 500 species with 19 major habitats and 32 focus exhibits showcasing three regions of the Pacific Ocean: Southern California/Baja, Tropical Pacific and Northern Pacific. The Aquarium is celebrating their 10 year anniversary this year, and offers several touch pools, where guests can get up close and personal with rays, sea cucumbers and starfish. There are also stations located throughout the Aquarium where children can stamp their visitor's guides and learn more about the inhabitants and take home a record of their visit. The Aquarium of the Pacific accomodates all abilities. Service dogs are welcome, wheelchairs are available as well as audio programs for visually impaired visitors. Show scripts are available for the hearing impaired. Visit the Information Desk for more information. Memberships are available, so consider joining this non-profit attraction if you enjoy your visit. A membership is a great way to be able to return at your convenience and avoid crowds. it also lessens the pressure to see everything, since you can come back anytime you like. Autism Family Night requires an advance reservation, so make sure you call before Friday, June 19th to guarantee your spot. Father John Groner’s service dog, Lilly, accompanies him everywhere. His life depends on it, and so does his ministry. “She has given me a way to remain an active parish priest, and that has meant everything to me,” said Father Groner, pastor of St. Robert Bellarmine in St. Robert and St. Jude in Richland. The priest has Type I diabetes, which occasionally causes his blood-sugar level to fall to a dangerous level. Without treatment, that could lead to seizures and other health emergencies. The human body gives off a slightly different smell when a person’s blood sugar is low. People don’t notice the change. But Lilly, trained since birth to be Father Groner’s service dog, knows the difference immediately. The yellow Labrador-Brittany mix also is tuned in to changes in Father Groner’s behavior that might suggest low blood sugar. She licks his face to tell him he needs to take a sugar pill so his brain gets the glucose it needs to function properly. Otherwise, he could black out. The priest did black out on several occasions before he got Lilly and his housekeeper had to come to his rescue. “It was getting to where I could no longer function in active ministry,” the priest said, but he didn’t want to give up the priesthood or his role as pastor. Michele Reinkemeyer, founder and executive director of Heaven Scent Paws in St. Elizabeth, helped Father Groner train Lilly, using a program she and her husband had developed to help their own children. Their training techniques turned out to be an answer to Father Groner’s prayers, too. The priest introduced the dog to his parishioners when she was just a puppy. “I said, ‘She is not trained yet, but I want you all to meet my service dog,’” he said. “So I walked up the aisle, and she just followed me all the way up to the altar. I put her in my palm and held her up and showed her to everybody. “That was her first time in church, and she’s been in church with me ever since then,” he said. Under federal and state law, Father Groner may bring his service dog with him to any public setting. He said children like to watch her at Mass because he thinks they feel a closeness to her. Similarly, some of the men on a recent Residents Encounter Christ weekend at the Algoa Correctional Center in Jefferson City were drawn to Father Groner’s preaching and counseling after first being drawn to Lilly. Lilly is now as familiar a sight in St. Robert Bellarmine and St. Jude churches as the cantors and sacristans. At the chrism Mass each year, she joins Father Groner and all the other concelebrating priests in the sanctuary of the Cathedral of St. Joseph in Jefferson City. She’s used to the crowds and commotion and knows how to keep a low profile. “She’s grown up around the church,” said Father Groner. “She has no trouble with sitting off to the side until Mass is over. People are used to seeing her. They know she’s going to be on the sanctuary and doesn’t mess anything up. She’s very well-behaved and doesn’t cause any problems. More information about Heaven Scent Paws can be found on the Internet at www.heavenscentpaws.com. Korea: Visually impaired mothers a cooking up a storm! Kim Sun-mi, 33, the mother of two children, learns baking once a week at the Korean Red Cross' Nowon branch in northern Seoul. "Children like my bread more than that of a bakery. It's more delicious because I make it with good materials and my whole heart," she said. Kim may be one among a growing number of Korean mothers who became interested in home cooking after some food safety-related scandals, such as the latest Chinese melamine-containing snacks, happened here in recent months. But Kim and other women who attended the baking class on last Thursday were special -- they are visually impaired. The blind mothers have participated in a three-month baking program from early April that is sponsored by the Ministry of Gender Equality and the Korea Blind Union which support similar programs for people with disabilities. "For the last three years, our programs have gained great response from blind mothers," said Hong Eun-yeo, a social worker at the union for the blind. "We conducted a survey in preparation for this year's programs and a lot of responding women showed their great interests in the current well-being trend. So, we launched a baking class helping them make both delicious and nutritious snacks for their children." It may seem unthinkable for people to cook without being able to see. But most of the blind mothers cook for themselves, sometimes helped by family members or volunteers. "Except for some complicated cooking skills such as frying with a lot of oil, blind mothers can cook after being trained briefly and becoming accustomed to it," said Hong, who is also visually impaired. The scene at the baking class was not very different from those of other cooking classes. Most mothers, excluding some with severe visual disability, participated in every process in the class, including preparing the necessary materials, kneading dough, decorating the surface of the bread and arranging tools. The only difference was the presence of the volunteers. They helped the mothers by letting them touch the materials and sometimes intervening in the most difficult tasks. They also took care of some dangerous things, such as the knives and push sticks for the safety of attending mothers. Lee Hye-sung has been working as a volunteer worker at the charity for more than 11 years. "Blind mothers may feel some difficulties, but it's nothing difficult for me to help them. I am thankful for the job as I can help others while learning the new field of baking," she said. For most of the mothers, attending the class is more than learning something new. For Koh So-hyun, the more than one-hour way from Gwanak-gu where she lives to the charity center is not a big deal to catch the rare opportunity. Even though it was raining, all the registered members, except one, attended the class in the day. "Actually I don't like cooking," she said with smile. "But this is a rare opportunity for us to learn something, so I'm enjoying the class. My fussy husband also likes bread that I make." Cho Eun-hee, 40, said she was "a little nervous" when she tried to cook something complicated. "But now I feel confidence," she said. "My child waits for me to cook and that encourages me a lot." According to the government's survey of the disabled last year, there were some 220,000 visually impaired people accounting for 10 percent of the total 1.7 million people with disabilities. In the survey, they pointed out cultural and leisure opportunities are most needed in their daily life along with job training programs and medical supports. The organizers of the program also offer them chances to help others as they donate their bread to shelters for single mothers once a month. "We, the visually disable, hardly have a social life," said Kim. "But through this opportunity I can spend my spare time more meaningfully and feel a great achievement." Delhi University (DU) has installed talking computers to assist the visually impaired students taking admission for the 2009 session. Seema M Parihar, Deputy Dean Students' Welfare, said that talking computers were introduced in the admission process this year, after it was realized, during last year's admissions, that many visually-impaired candidates were unable to read Braille. DU reserves 3% seats in all its affiliated colleges for the differently abled. Last year, the university introduced Braille form for the visually impaired students. Now, with the added facility of talking computers, DU aims to make the entire admission procedure more convenient for the visually impaired. Moreover, they would be guided by counselor in filling up the forms. As per the records, thirty three visually impaired students have already registered themselves for admission to DU this year. Teenage crook who took advantage of a visually impaired clerk got caught! The voice and the Doritos gave him away. At the same time, they helped lift the spirits of a visually impaired snack-bar operator targeted four times in one day with customers paying with counterfeit $100 bills. It happened this week, in of all places, the Summit County Courthouse. Laura Kolb, 34, whose vision has been diminished since birth, has operated the downtown Akron courthouse snack bar for less than two months. She has battled sight issues, cancer, an arsonist for a neighbor and bankruptcy in her 34 years. And when her husband, David, called from the bank Tuesday, she was ready to chuck her new business and head into solitude. During the course of business Monday — selling the daily lunch specials, coffee, soda and chips — Kolb was paid four times with fake $100 bills. To her, it was like being kicked in the stomach and pocketbook at the same time. ''This isn't some big money-making place. That $400 is a big part of the week's profits,'' she said from the snack-bar register Thursday. Kolb, a mother of four, said she thought about giving up the business opportunity from the Society of the Blind, which staffs courthouse snack bars throughout Ohio. Then she changed her mind and decided to play detective using one of her greatest senses: her ears. She remembered the voice of one of the $100 customers; a soft-spoken, younger man who ordered only a bag of Doritos. She told snack bar worker Bruce Golomboski on Wednesday that she would signal him if the customer was brazen enough to return. ''I got a bag of Doritos, and here's a $100 bill,'' the voice said. Kolb yelled to Golomboski, who is also visually impaired. That customer's voice was stuck in her head. ''Hey, Bruce, can you get me some 20s from the safe?'' she asked. There is no safe behind the counter. The phrase was her cue for Golomboski to call the cops. As the customer sensed trouble, he began to walk away, leaving his $100 bill in Kolb's hand. Law enforcement, naturally, wasn't far behind in a courthouse. The 16-year-old boy was detained by an Akron police officer near the snack bar and passed over to a sheriff's deputy, who was also nearby. David Lee, resident agent in charge of the U.S. Secret Service Office in Akron, said counterfeiting is a constant battle for law enforcement, only made tougher by modern technology. He said the counterfeit-detecting pen, like the one that failed Kolb four times Monday, is not endorsed by the federal government and is not 100 percent reliable. The bogus bills handed to Kolb were $5 and $10 bills manipulated to look and feel like a $100 bill. Business owners and consumers, if possible, must look closely at large bills being passed, he said. Kolb said she hopes her actions will help other businesses be aware. She also said she has a new policy at the snack bar: no bills larger than $20. In the meantime, authorities are searching for other suspects from Monday and to determine if the teen is part of a larger group of adult counterfeiters circulating bills to area businesses.